In today’s competitive environment, manufacturers need to find ways to reduce their costs and improve efficiency. One of the ways through which companies can reduce their costs is to use office or storage space more effectively. The costs benefits of effective use of space include streamlined production and material handling. Instead of doing away with some company assets to create more room for new equipment in your organization, you can install mezzanine floor systems, which are more effective and affordable. Mezzanines have been successfully used by many companies over the years due to their ease of installation, durability and cost savings. Panel Built’s mezzanines allow you to get more space in your work area without having to lease or buy another building. Our versatile structures create new areas that can be used as office, for storage or manufacturing from your currently available space. We focus on ensuring our mezzanines will help you reduce cost and provide a spacious, efficient and safe work environment. To use office or storage space more effectively, the specific requirements, work flow and dimensions of the plant must be analyzed carefully. Our mezzanine flows are custom designed and built for the load and production requirements, height and area of each individual facility based on the findings of a detailed site analysis. For over 10 years, Panel Built has been helping manufacturers achieve more space out of their existing space while keeping their costs down. We offer our products to both government and corporate customers, ensuring their requirements are met through our custom built systems. We can be your single source for space utilization solutions that require both modular and mezzanine building systems. As your single provider, we have greater engineering control that enables us to come up with strong and durable structures that are cost effective. These structures are custom-built in our workshop and delivered on time. Our superior structures set the standard for quality design and strength. By installing our mezzanine systems, you will immediately get additional floor space by maximizing your current facility’s headroom. Our diverse mezzanine floors that can match any requirements, be they office space or storage. Go through our website to learn more about our systems. We source our products from a single vendor. This eliminates the majority of contractor coordination and scheduling. Our pre-engineering mezzanines are built according to the highest industrial standards, feature streamline design and are easy to install. Our mezzanine floors cost less than conventional construction and are considered as movable furniture. This means you will not have to pay taxes on them. We provide a variety of mezzanines that fit various decking options based on your requirements. We have multiple gate options to enable quick and easy access to storage materials. You can easily access plant inventory from the ground below to the mezzanine decks. Our integration of modular buildings and mezzanine floor ensures proper fit between both products. Our mezzanines come with time tested features that make them strong and durable. We have installed the systems all across the country for over 10 years. We can install the floors anywhere you are located in the United States. We can design your mezzanines floor to match the unique requirements of your individual projects. Installing our modular mezzanine systems takes a shorter time than conventional construction. This is because the floors are sourced from limited manufacturers, and come pre-engineered. We have over 10 years’ experience in constructing mezzanine floors that are unique and superior. Our products are time-tested and superior, offerings strength and durability. Our modular building systems and mezzanine floors are coated with extremely durable polyurethane acrylic enamel. These make them capable of withstanding the harshest conditions and can therefore operate with minimal maintenance for many years. Our mezzanine building systems guard rails are welded in the factory for superior strength and for ease of installation. The mezzanines stair design provides a stronger stair than designs that are bolted in the field. Our modular floor streams are designed to be in compliance with the International Building code as a standard. In most cases, our standards surpass the requirements of local code. Our mezzanine floors are sized before they are shipped. This ensures that our jobsite remain dramatically clean when compared to conventional construction. Apart from this, our installation causes less operations disruptions and less noise. Together with mezzanine systems, we also supply different accessories and pre-fabricated integrated mezzanine systems. Other available accessories include modular offices, wire partitions, racks, fire suppression systems, shelving, lighting packages, conveyor and material lifts. 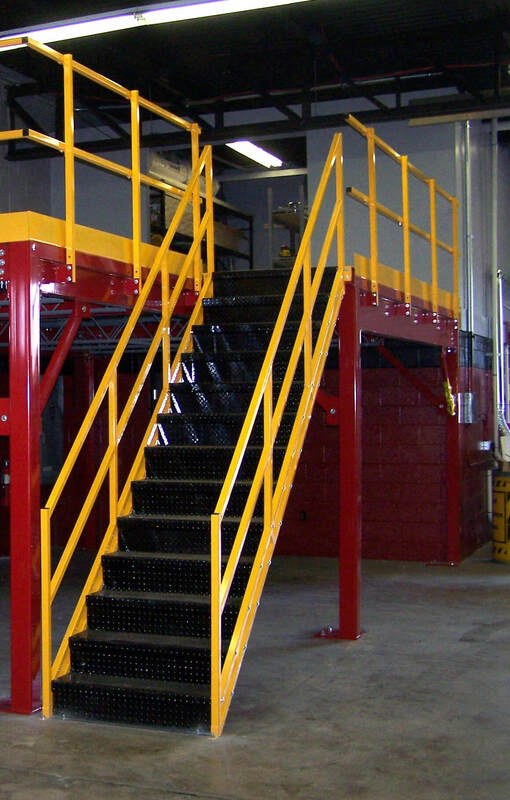 Click here to contact us and request for a quote or to learn more about our mezzanine systems.